Uke grabs both of tori's wrists. 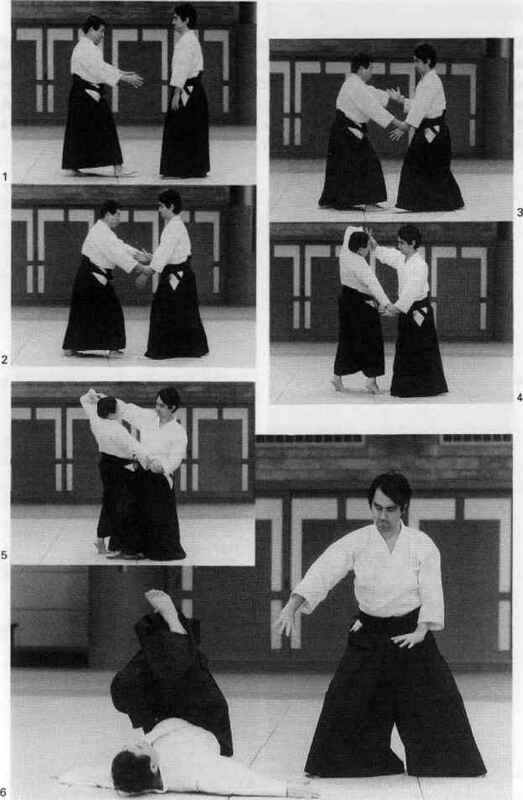 Tori steps forward with his left leg and immediately executes aiki-age with his right hand and aiki-sage with his left hand. 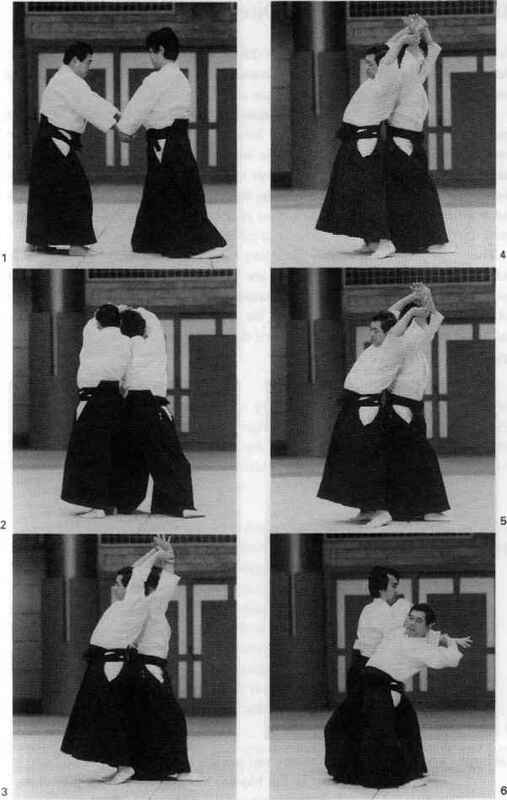 Tori takes a wide step to the rear of uke, and brings both his hands together to complete the throw. 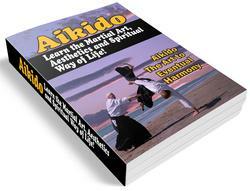 If uke's grip is very strong and it is difficult to execute aiki-age, apply the "yin-yang" movement (in'yo no den). First turn the palm upward (yin) to neutralize uke's power, and then turn the palm downward (yang) while raising the arm, to guide uke in the proper direction. 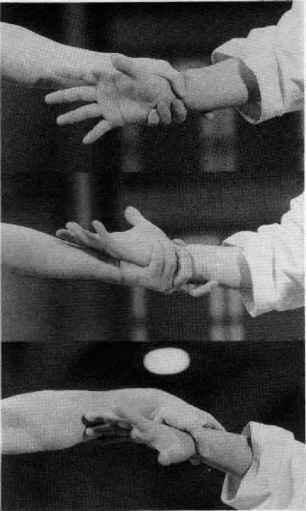 When the opponent grasps your hand forcefully and you find that you are unable to do aiki-age, turn your hand first palm up, and then over so that the back faces up. This way, you can make your opponent's strength veer off course and free your own hand so that you can easily control the opponent. Uke grabs tori's left wrist with his right hand. Tori slides forward on his left leg and delivers atemi to uke's face with his right hand. 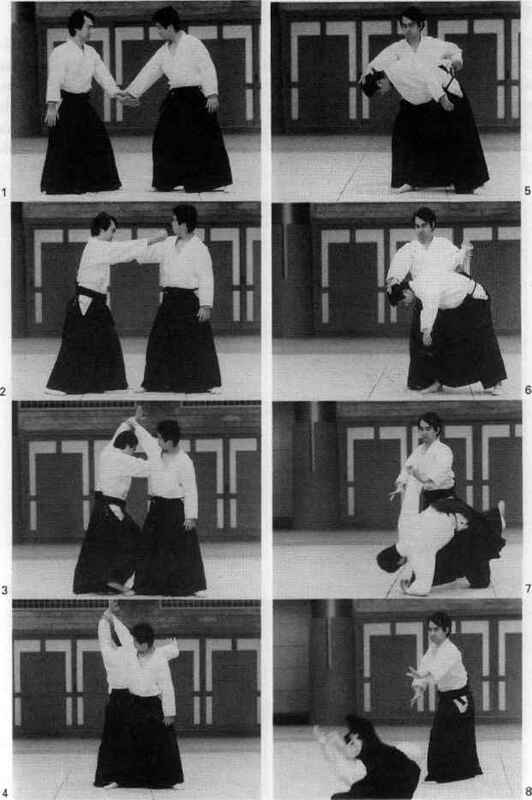 Tori steps in with his right leg, turns 180 degrees, and then steps back on his left leg, changing his grip on uke's wrist Tori guides uke's head down with a "feathery touch" (umd no den) with his right hand, then steps forward to complete the throw. In this and in several other techniques, a light, feathery touch is more effective than a rough, sudden pull.